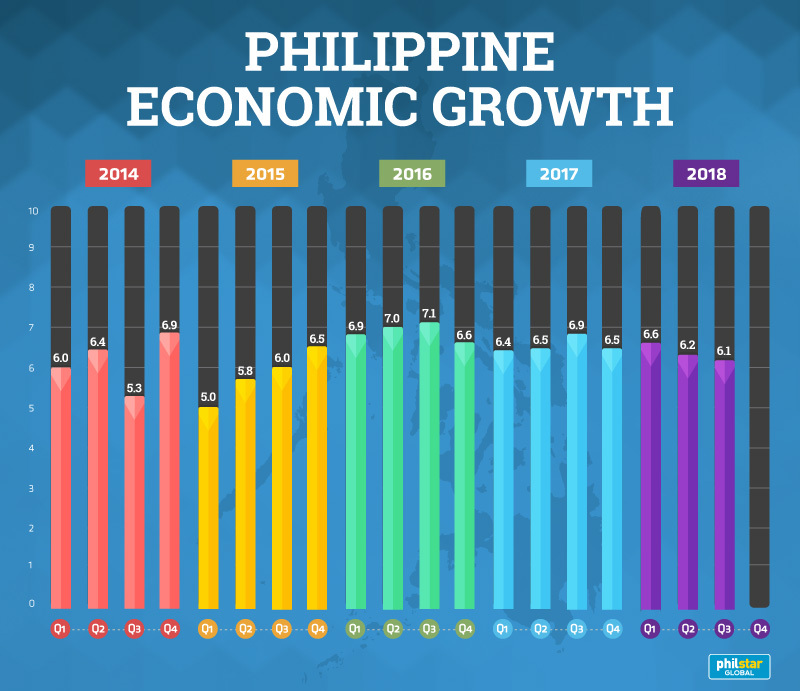 MANILA, Philippines� (Update 2, 2:19� p.m.)� — The Philippine economy expanded at a slower pace in the third quarter amid weak consumer spending and lackluster agriculture growth, which may give the central bank a chance to hit the� pause� button on policy tightening to rein in inflation. Gross domestic product — or the value of all finished goods and services produced in the country — eased to 6.1 percent, softer than the upwardly revised 6.2 percent in the previous quarter and 7.2 percent clip posted a year ago. The latest reading fell below the government’s 6.5-6.9 percent goal for the year, and was also the slowest pace since the 6 percent GDP print in the second quarter of 2015. For the first nine months, GDP growth averaged 6.3 percent. At a press conference, Socioeconomic Planning Secretary Ernesto Pernia explained that stubbornly high inflation and tighter monetary policy contributed to the economy’s slowdown in the July-September period. Pernia said the Philippines would have expanded by 6.5-7 percent had soaring prices been controlled, adding that the state’s target for this year is now “much more challenging” to hit. 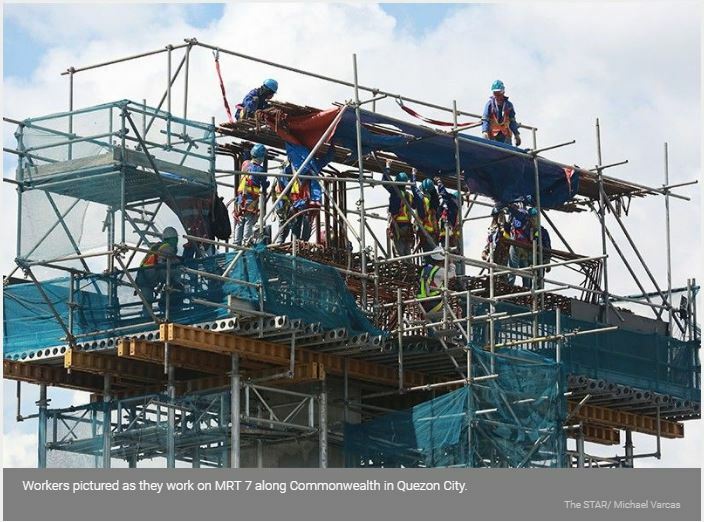 “With this, the Philippines needs to expand by at least 7.0 percent in the fourth quarter to attain the low-end of the government’s target… for the whole of 2018,” Pernia said. Inflation clocked in at 6.7 percent in October, unchanged from September’s clip but still the fastest� pace� in nearly a decade. In a bid to temper consumer demand that likely lifted prices, the BSP has delivered rapid-fire interest rate hikes of 1.5 percentage points since May, its strongest action against inflation since 2000. Some analysts expect economic growth to continue to decelerate over the next quarters as high interest rates and red-hot inflation weigh on consumer spending, which has been� traditionally the driving force behind growth. “The upshot is that the economy is set to underperform,” said Alex Holmes, Asia economist at Capital Economics. “We expect the slowdown in GDP growth in Q3 to continue over the coming quarters as the economy faces headwinds from tighter monetary policy and a weakening external environment,” Holmes added. In the July-September period, household consumption grew 5.2 percent, its lowest level in four years, from 5.9 percent in the second quarter. In same press briefing, Pernia said consumer demand is expected to rise during the Christmas shopping season. “With the measures we have been pushing for, the slowdown in household spending is deemed to be abatable and temporary. But we can only do so much,”Pernia said. Separately, Nicholas Mapa, senior economist at ING Bank in Manila, said the disappointing growth print may give some ammunition for the doves to call for a pause at the next Bangko Sentral ng Pilipinas meeting on November 15. “The 150 basis point cumulative rate hike for the year is likely weighing on consumption and will dampen investment going forward,” Mapa said.